Radiation has been used in the treatment of prostate cancer for nearly a century. Following Roentgen’ s discovery of the X-ray in 1895 (96), and the isolation of radium by Pierre and Marie Curie in 1898 (21), several physicians began treating prostate disorders, including prostate cancer, with radiation. In 1910, Paschkis and Tittinger inserted radium into the prostatic urethra with a cystoscope in what appears to be the first documented use of radiation for prostate cancer. 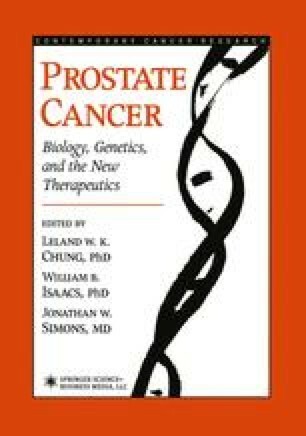 Not long after, Hugh Young from Johns Hopkins reported a relatively large usage of treating prostate cancer patients with urethral and rectal radium “applicators” (127). These early studies revealed that radiation applied in this crude fashion could improve a patient’s local symptoms and eliminate prostate cancer, but was difficult to perform and uncomfortable for the patient. In 1928, Barringer was one of the first to report on the use of externally-delivered low-energy kilovoltage radiation for prostate cancer (5). Dosimetric considerations were not well understood, and patients were treated until their skin turned red. These types of low-energy radiation machines were used until cobalt machines became available and provided the first opportunity to treat more deeply seated tumors in the body. The first reported series of prostate cancer patients treated with cobalt-60 therapy, by George et al. in 1965, focused on patients with unresectable disease (40). It was not until the development of the megavoltage linear accelerator at Stanford University in the late 1950s (62) and the pioneering work of Bagshaw, Kaplan, Del Ragato, and others, that the modern era of radiation therapy for prostate cancer began revealing the possibility of radiation curability in this disease (4,26). Drawing from these beginnings, we now use three-dimensional conformal plans to drive high-energy accelerators with sophisticated dynamic shielding in order to treat the prostate with a high dose of radiation while sparing the surrounding normal tissues.